Corns are thick and hardened skin layer that forms when the skin is subjected to continual intense pressure or friction. Calluses are larger than corns. Foot corns and calluses are the most common form of corns/calluses. People that are physically active, such as athletes, and people that tend to wear ill-fitted shoes tend to have corns and calluses. Corns most often develop on the toes, especially the top and sides of the toes. Other people that tend to have corns include; people with bunions or hammertoes, people with scars or warts on their feet and people with damaged sweat glands. Symptoms of corns and calluses include; hard raised skin bump, thick and rough skin, pain when pressing on the corn. 1. Turmeric: Apply Turmeric Powder Paste To The Affected Area. Turmeric Has Anti-Inflammatory Properties That Help Reduce Swelling, Discomfort, Pain And Makes The Healing Process Faster. 3. Vinegar: Dab A Little White Vinegar On The Corn Or Callus. White Vinegar Helps Soften The Corn/Callus Due To Its High Acidity. White Vinegar Is Also Antimicrobial Which Helps To Prevent Infections. 5. Pineapple: Apply Pineapple Poultice To The Affected Area Overnight. You Can Use Pumice Stone To Massage Area After Removal Of Pineapple Poultice. Pineapple Contains Certain Enzymes That Help Soften The Corn. 6. Lemon Juice: Apply Lemon Juice To The Corn Or Callus. The Citric Acid In Lemon Juice Helps Soften The Thick And Hard Skin Which Would Hasten The Skin To Fall Out. 7. Turpentine Oil: Wash Affected Area With Cold Water. Then Apply Turpentine Oil To The Corn/Callus. Turpentine Oil Is A Strong Antiseptic That Helps Prevent Infections. It Also Penetrates The Corn/Callus Effectively. Thus, Quickening The Healing Process. 10. Papaya: Apply Mashed Papaya Poultice To The Affected Area For A Couple Of Hours. Gently Massage The Affected Area With Pumice Stone On Remove Of The Papaya Poultice. There Are Enzymes In Carica Papaya That Helps Remove Thick, Hardened Skin. This Makes Papaya A Good Home Remedy For Corns And Calluses Removal. 11. Licorice: Apply A Paste Of Licorice Powder And Castor Oil Poultice To The Corn/Callus Overnight. Wash Off In The Morning. This Would Help Soften The Corn/Callus And Help Reduce The Size Of The Corn/Callus. 12. Pumice Stone: Gently Rub Pumice Stone On The Corn Or Callus. Apply Castor Oil Thereafter. The Pumice Stone Would Abrade The Layers Of Hardened Skin, Which Is The Corn. This Would Help Reduce The Pain And Facilitate The Healing Of The Skin. 13. 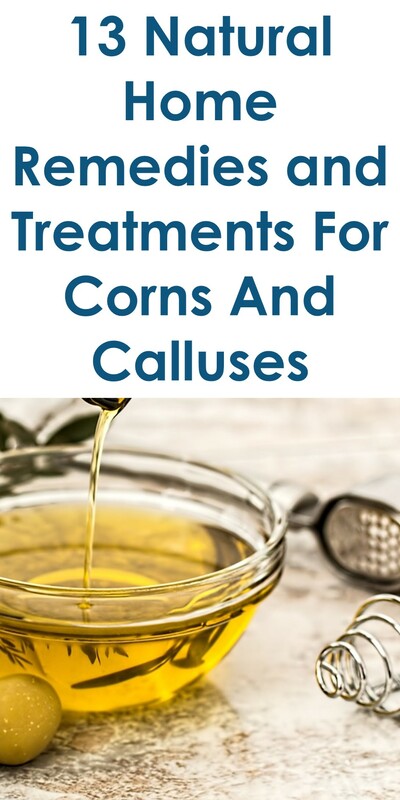 Castor Oil: Apply Castor Oil On The Corn/Callus. Castor Oil Would Soften The Corn, Thus, Facilitating The Healing Process. However, Do Not Apply Castor Oil On Broken Skin.